In 2008 we acquired a 160 acre pasture property in Childress County, Texas where we will be expanding our natural grass fed beef program. 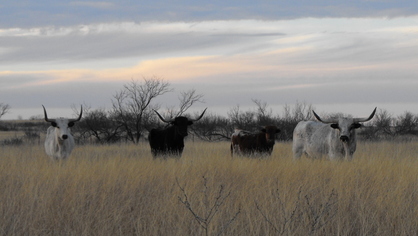 Initially, we are concentrating on about 58 acres of this area to install cross fencing and a corral area for re-locating some of our Longhorn herd to that "RAF #2" facility to reduce the grazing stress on our headquarters 23 acre property in Collingsworth County, TX. As of November 2012 all cross fencing and water lines have been installed. This gives us 7 seperate pastures to rotate with for any young stock that are there. Our facilities at Running Arrow Farm were designed, constructed, and maintained for the benefit and ease of handling of our cattle and horses, as well as to accommodate our visitors. We have several 14' wide alleyways which separate the various "pastures" so we can effectively manage our longhorn herd sires. 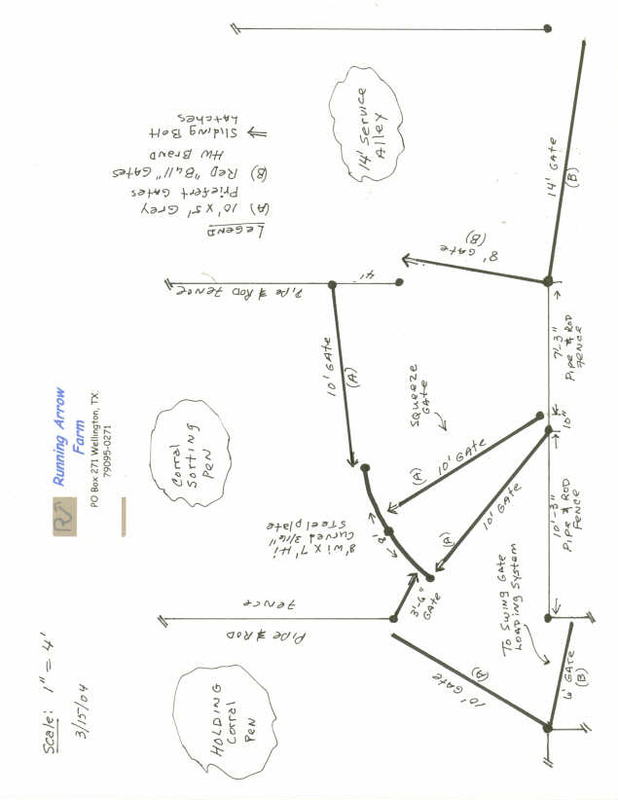 In our facility infrastructure, one person can easily relocate any given group of animals (right/left, up/down, and diagonally) from one pen to another in a matter of minutes. When we acquired our present property in 2002, we began a major re-construction program which ultimately resulted in all new fences and cross fences by the end of 2005. Our barbed wire fences are 5-1/2 feet high with 7 barbed wires. Since we have a major highway fronting our property, we put 8 barbed wires on this side of our property. We sleep very well at night! 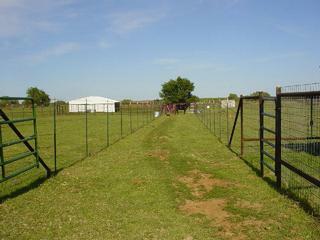 We also have 80+ gates to further facilitate cattle holding, movement, and sorting. Additionally, in our 50 x 75' pipe & rod fenced corral (which has 3 sorting areas), we have a custom-built "Medina Hinge" set-up for restraining our cattle for working. This area also has a digital scale unit. Adjacent to this area we have a Calf Table. Exiting this area to the South is our short alleyway which enters into a curved area with a Swing Gate for "herding" one or more cattle into an exit for loading onto a trailer. Every pen, pasture area has its own water tank and water faucets are within 50 feet of each tank. 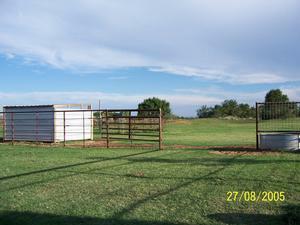 We have almost completed building our loafing sheds for each of our small pastures and pens. We use our alleyways for temporary grazing areas to keep the grass "mowed" as well as a holding area for our cattle while we put a new round bale of hay in their area. Allowing the Longhorns into the various alleys gives our Longhorns positive re-enforcement/reward for coming out of their pastures without cubes or hand feeding of any kind. Which means we do not get mobbed by the cube hounds. We use simple voice/hand commands to move our various Longhorns as they also respond to their pasture names.